Maud Arncliffe-Sennett (1862-1936). Born in London, the daughter of an Italian immigrant wholesale confectioner, Maud and her husband Henry ran her family's firm of 'G Sparagnapane & Co, The Oldest Established manufacturers of Christmas Crackers and Wedding Cake Ornaments' in the Italian district of Clerkenwell. 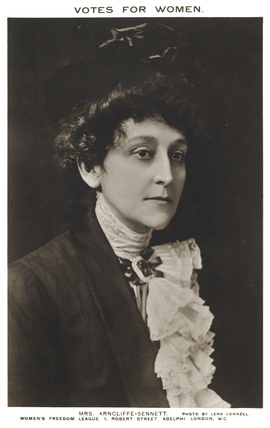 Like many women who followed the suffrage movement Maud was a member of several suffrage societies, often holding multiple memberships simultaneously. For some years she divided her allegiance between both the constitutionalists and the militants being a member of the NUWSS, the WSPU, the London Society for Women's Suffrage, the Women's Freedom League, the United Suffragists and the Actresses' Franchise League. As well as serving office in these four latter organisations she also founded, in July 1913 the Northern men's Federation for Women's Suffrage.